A beautiful, responsive blog and homepage theme with support for features like search, math typesetting, and RemarkJS presentations. 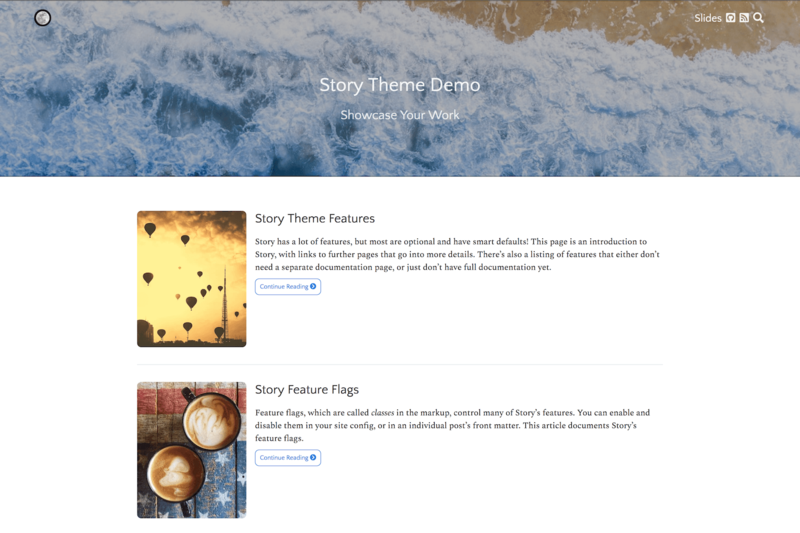 Story is a beautiful Hugo theme for showcasing your writing and presentations. There’s a robust demo site where you can see its many features in action, and learn more about how to use them. You can also see Story in use on a real site by Baron Schwartz. Story is targeted to technical writers and speakers: people such as software engineers and open source developers, who want a website for their technical work, such as blogging about software engineering. It’s a great way to share your writing and speaking with the world. It has a lot of features for people who invest effort in their websites and blogs! Beautiful, responsive typography for long-form content on screen and in print, including blogs, essays, and single pages. A built-in search page with LunrJS. Music notation typesetting with abcjs. Easy-to-use, backwards-compatible Markdown enhancements such as ways to control image behavior (size, float, etc) with CSS. This is just a fraction of Story’s feature set, see the demo site for much more documentation and screenshots.